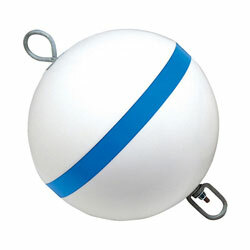 Taylor Made Traditional Sur-Moor Mooring Buoy - 15"
Blue stripe is reflective for nighttime visibility. Buoyancy Rating: The number indicated is the maximum flotation the buoy provides while fully submerged. 50% of this value will be the weight the buoy can support at the level of the blue stripe. Taylor Made Super Deluxe Pick-up Buoy - 48"
Mast Length: 48", Mast Diameter: 5/16"
Taylor Made Replacement Buoy Rod- 15"
Taylor Made Replacement Buoy Rod- 18"